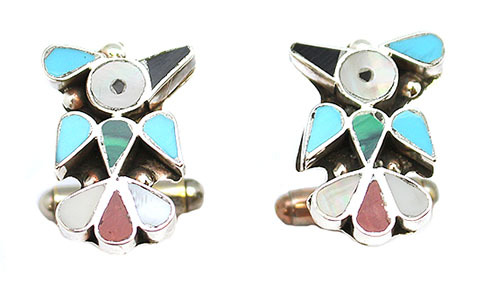 These thunderbird cuff links are inlaid with synthetic turquoise, jet, malachite, mother of pearl and coral set in sterling silver. The measures approximately 7/8" long and 5/8" wide at widest point. Native handcrafted by Zuni artisan Pino Yunie. Colors and placements will vary.